"A tasty way to dress up cauliflower that's easy and elegant." Spread cauliflower florets onto a baking sheet; season with salt and pepper. Bake in the preheated oven for 10 minutes. Stir cauliflower and continue baking until golden brown around the edges, about 20 more minutes. Heat butter in a small skillet over medium-low heat; cook and stir pine nuts until golden brown, about 5 minutes. Add dates and garlic to pine nuts; cook until dates are softened, 2 to 3 minutes. Season with salt. Transfer hot cauliflower to a serving bowl. Drizzle pine nut mixture over cauliflower and toss to coat. Serve warm or at room temperature. Here's a new way to roast cauliflower. I absolutely loved this recipe! 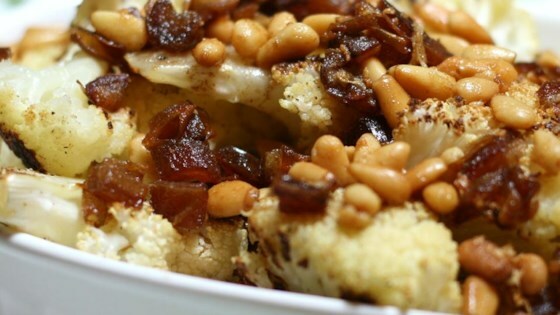 The dates and pine nuts with the cauliflower were an amazing combination. I will use this recipe over and over again. Super simple recipe! Really tasty and flavorful. I can make it in about 30 minutes. I brought this to a Church pot luck and it was a big hit. Easy to make, low calorie (everything else had cheese and or cream of mushroom soup) delicious !! I will be making this again and again. Super easy to make and was an excellent side at our potluck party. Received a lot of compliments.